TMC president and West Bengal Chief Minister Mamata Banerjee has made an intriguing move by removing TMC Hills president Rajen Mukhia and replacing him with Mirik municipality chairman L.B. Rai. The re-shuffle was done on Friday during a core committee meeting of the TMC chaired by Mamata. The sudden development comes as a shocker considering that Mukhia was actively pushing the TMC in the hills against overwhelming odds. “L.B. Rai was declared as the president of TMC Hills unit while Shanta Chettri and Subhamoy Chatterjee were made as working presidents. The announcement was made by the Chief Minister at a core committee meeting yesterday,” said TMC Hills general secretary Binny Sharma. Sharma could not shed any light on the removal of Mukhia as the president of TMC Hills unit. “I welcome the move but I do not have any idea as to the reason behind it,” said Rai when contacted. Mukhia also told media that he was unaware about the reason for the re-shuffling. “I want to congratulate Rai for being given the president’s post. We were not given any reason as to why all this happened. However, I want to point out that I was with the party even during its hard time in the hills when no one was willing to join the party along with the time when the TMC could form the board in Mirik municipality. The contribution I gave to the party seems to have no value,” said Mukhia. Asked if he will quit TMC, Mukhia said his next step will be known later. 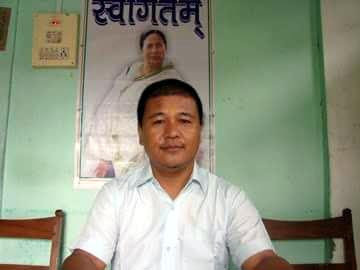 West Bengal Chief Minister Mamata Banerjee has made an intriguing move by removing TMC Hills president Rajen Mukhia and replacing him with Mirik municipality chairman L.B. Rai.